Do you normally get Valentine’s Day roses from someone you love? When it comes to traditions, nothing makes someone you care about smile more than being surprised at home or work with a beautiful arrangement. While I smile getting a cute arrangement from the grocery store, it really doesn’t compare to opening the front door and getting surprised by a beautiful, handcrafted arrangement of flowers. There is just something special about knowing someone created such a beautiful arrangement, just for you, and I smile every time I go downstairs and see the flowers first thing in my living room. When it comes to beautiful, locally made arrangements that are truly delivered with love and care, there is only one company I trust when it comes to flowers – Teleflora. To brighten up our house for the holidays, we were excited to have the Love’s Passion Bouquet by Teleflora delivered to our home by a local florist in our area. After it arrived, I couldn’t wait to share this gorgeous boutique with all of you! Love’s Passion Bouquet by Teleflora: What is It? Looking for a beautiful bouquet to give someone special this Valentine’s Day? If so, we think you will truly love the Love’s Passion Bouquet by Teleflora. 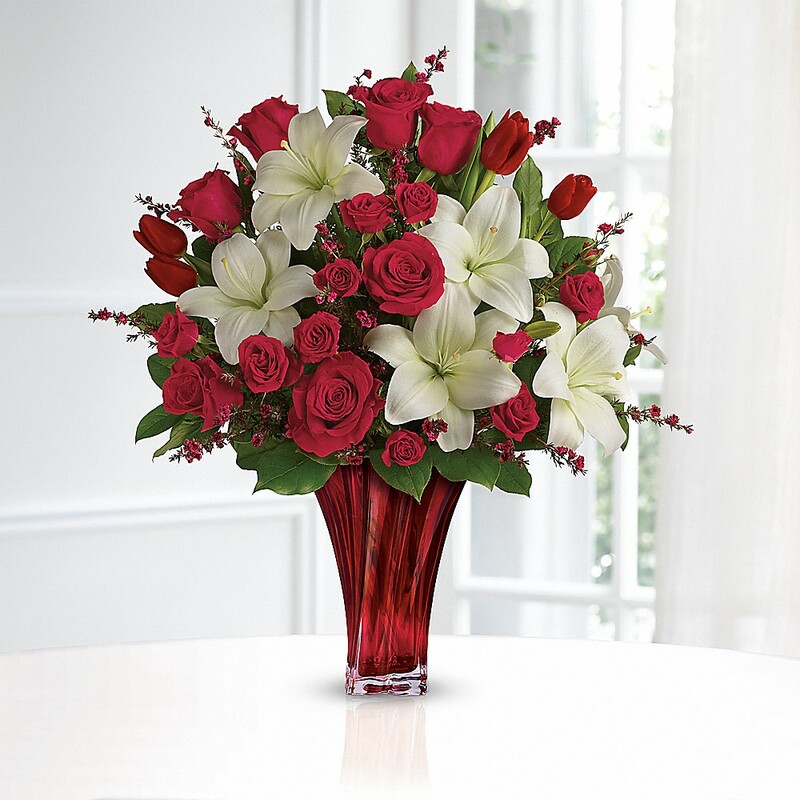 This truly breathtaking, elegant twist on a classic boutique has red roses, tulips, and white Asiatric lilies nested with an elegant but modern looking red vase that is perfect for any sophisticated lady. Like all arrangements from Teleflora, the Love’s Passion Bouquet is also handcrafted with fresh roses by a professional florist in your local area, guaranteeing a professional, gorgeous fresh arrangement that is hand delivered promptly to your loved one. If you are looking for a Valentine’s Day flower arrangement that will get attention in the office or just make someone special smile, we happily recommend this handcrafted boutique from Teleflora. When I first saw my Love’s Passion Bouquet by Teleflora arrangement, I have to admit – it was breathtaking! Everything with the arrangement seemed to be in perfect harmony. While I was expecting to love the roses the most, what truly caught my eye were the beautiful lilies. Mixed with the tulips, they truly made the red roses stand out, creating a beautiful valentine’s day arrangement unlike anything I had seen previous – this including roses I had received in previous years for the holidays. I even loved the beautiful accent flowers, which helped bring the entire arrangement together into a beautiful centerpiece that truly makes me smile every time I see it. I’m honestly glad that out of the entire list of flowers, this is the one my husband chose for me, especially with my love of lilies. Oh, and the best part was the smell. Never had I received flowers before this arrangement that smelled so wonderful. Normally flowers don’t have much of a smell (a side effect of freezing), but these flowers were truly fresh and you could tell had not been refrigerated much all, especially with how they are making my entire living room smell amazing. With fast, courteous delivery and beautiful flowers, what else could a girl ask for this Valentine’s Day? 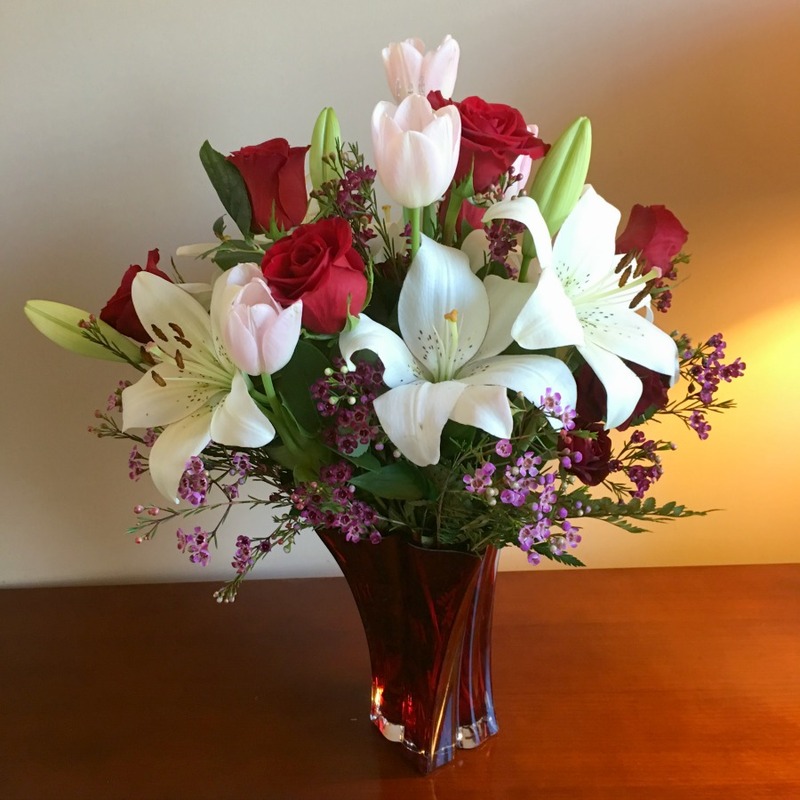 Based on our experience, we are delighted to give the Love’s Passion Bouquet by Teleflora an A+ rating and highly recommend this or another handmade arrangement from Teleflora this holiday season. Love’s Passion Bouquet by Teleflora: Where to Purchase? Would you like to purchase this beautiful boutique for someone you love this Valentine’s Day? You can purchase the Love’s Passion Bouquet by Teleflora on their website starting at only $99.95. Oh, and they are also offering 15% off sitewide with coupon code EMTOC25 through Feb 28, 2017. Not sure if this is the arrangement you want? 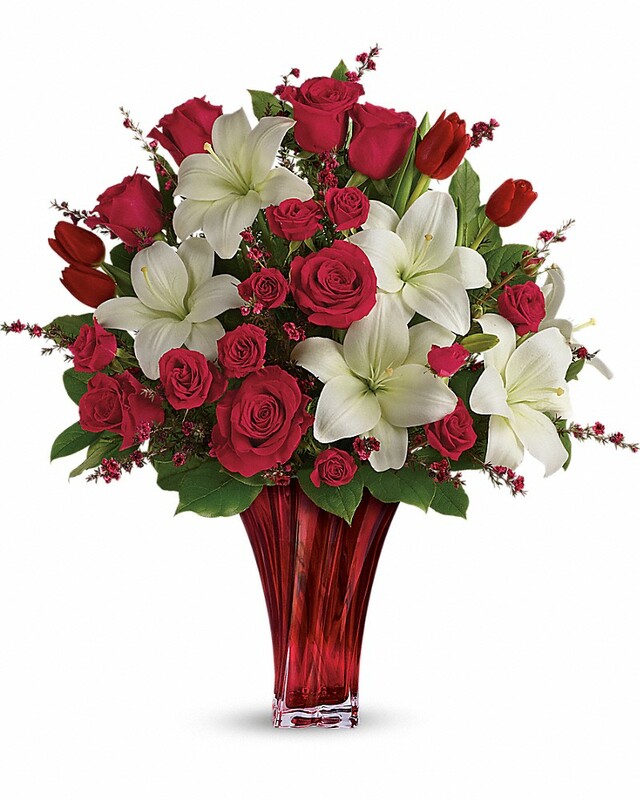 Teleflora has 90+ arrangements for Valentine’s Day alone, allowing you to fin d the perfect arrangement for a wife, girlfriend, mother, or just someone you want to make smile this Valentine’s Day. Make sure to head over to Teleflora yourself to find the perfect arrangement for someone you love today! Teleflora has such beautiful flowers. The colors of these flowers in the photo are just lovely. I would be so happy to receive a bouquet like any of these. Be still my heart! Those are the most beautiful flower arrangements that I have ever seen! You just can’t beat Teleflora! They make magic with flowers. What more can you ask for?Someone tell my husband about these……. For the review my husband actually chose these out of the list. I had no clue what I was getting until they arrived. It was so much fun! I love fresh roses, and all types of flowers, but roses are one of my favorites. I just wish they lasted longer, lol. So I press them. I love giving flowers to others. I’ve always used Proflowers and loved their service. I love these flowers and will look into teleflora too. To keep your flowers fresher longer add a mini vodka to the water they will stay fresher for more than 19 -12 days. Just remember to add a little water as needed. The Love’s Passion Bouquet is indeed breathtaking! Lilies are my fave flowers. These boquets are so beautiful but I just can’t stop thinking about the price. I could buy several rose bushes and lilies for that price. It’s just so complicated. I’d love to have them, but I’d also be sad to watch them whither away. Roses can be dried but lilies can’t. This is a very pretty bouquet. Love the pictures of your fur babies with them on instagram. I remember my dad ordering these for my mom and grandma every year,they were always thrilled to get them. I like the flowers and vase, but not the price. A gift card giveaway would be nice. These are just beautiful! I might meet the right valentine one day! The bouquet is absolutely beautiful! I tell my husband to not buy flowers for Valentine’s though because they are too expensive. I actually saw rose bouquets on clearance at Walmart last night – only $7.99 for a dozen. They are gorgeous!! I love the mix of roses and lilies!! Seriously such an amazing combo!! That’s a pretty arrangement. Teleflora has never disappointed me. The flowers are always fresh and beautiful. Not so with some other places that deliver flowers. These are pretty! Any lady would be lucky to get these. I think every day is a great day for flowers. I love flowers! I love flowers. Who doesn’t? These are so beautiful. I would love to get them for mama for Mother’s Day.